Product #1637 | SKU 1486393 | 0.0 (no ratings yet) Thanks for your rating! 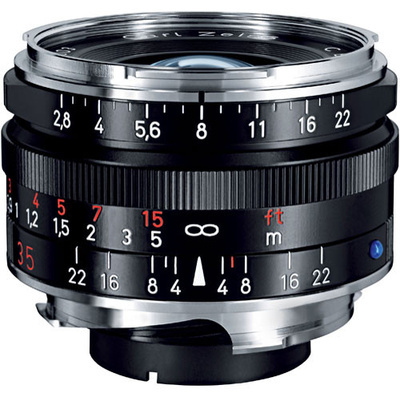 Characterised by its sleek form factor and versatility, the black C Biogon T* 35mm f/2.8 ZM from ZEISS is a notably compact wide-angle prime designed for M-mount rangefinder cameras. Its 'C' designation reflects the lens's compact form factor and classic optical design to produce imagery with true colour fidelity and natural rendering. The Biogon optical concept helps to ensure virtually no distortion, and one anomalous partial dispersion element is also used to reduce chromatic aberrations and colour fringing for improved clarity and colour accuracy. Additionally, a T* anti-reflective coating has also been applied to reduce lens flare and ghosting for increased contrast in strong lighting conditions. Type 'C' lens refers to this lens's classic aesthetic and exceptionally compact design. Manual focus design enables a minimum focusing distance of 70cm.